Who says art is optional?!! This wonderful story grabbed my heart on the first read. 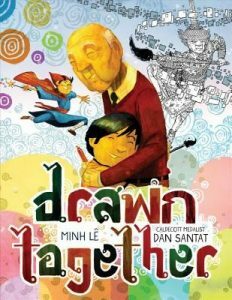 Drawn Together is an awesome book about the power of art, and its ability to bring all kinds of people together. A boy is dropped off, much against his will, to visit with his non-English-speaking grandpa. Without words the distance between them couldn’t be wider! What will they do all day, when neither can understand or communicate with the other? They try television (nope), sharing a lunch (umm, no). Eventually the boy gives up and goes to get his sketchpad and markers to pass the time. Suddenly Grandpa reappears- with HIS sketchpad and brushes! As they begin to draw together, pictures without words let them see each other as they are for the first time, and they create adventures and worlds to express themselves that build a bridge to love and understanding.